"HP has announced an update to the HP Mini 210...different curves, new punchy colors, edge-to-edge screen and a flush trackpad and buttons with specs largely unchanged, except the 6-cell battery (9.5 hours) looks better integrated and Beats Audio for better sound. You'll still get the same dual core Atom N550 (and probably N570), integrated GMA 3150 graphics and the usual specs that go along with it." 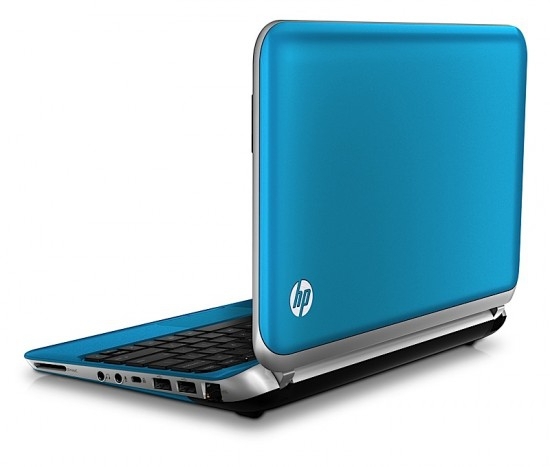 It seems like every time I blink, HP is refreshing their line of Mini netbooks, but that's not a bad thing: as a customer I appreciate them being competitive. The new 210 brings a new design to the cable - which I like - and some funky colours that include charcoal, ocean blue (pictured above), lavender frost, and ice berry. The big plus is the battery life which tops out at 10.75 hours - I think the 9.5 hour mark is for the dual-core CPU version. The only think I don't like is that HP has put Windows 7 Starter on the product, which allows them to hit a lower price point - it starts at $329 USD before any coupons or discounts - but gives the customer a less than ideal user experience. Still, for the price, this is a powerful little computer that would be perfect for a variety of uses.